I feel like everyone can relate to the panic of impending houseguests. First, there’s nonchalance. “Oh you’re in our neighborhood, how fun! You should stop by.” Then there’s the cold sweat of panic as you exclaim, in a high-pitched voice, “Yay, this is so exciting! What a fun surprise!” And then there’s the sense of doom that sets in. You look around your house. You die a little inside. You try to remember all the cleaning tips you’ve ever heard. And then you run around your house like a crazy person, trying to strategically decide what to tackle first. The dishes in the sink look awful, for example, but the duck potty full of pee in the living room and the dog food your toddler was having for a snack might prompt someone to alert the authorities. So yeah, you hit that first. And then spiral as far as you can before you hear the slam of a car door and pray your daughter flushed the toilet the last time she was in there. But there are hierarchies to this whole thing, too. What I have to clean depends entirely upon who is coming over. There’s a range there, from Christine all the way down to my mother-in-law, and our cleaning tips for each group adjust accordingly. Touch nothing. Do nothing. This is your person, here. You’re gonna be fine. Definitely flush the toilet. Remove the duck potty of pee. Put away things that are breakable or suddenly “very special” to Lila. Brew a very full pot of coffee. Forget about the toys and the dishes and the floors, this playdate is only gonna worsen those scenarios and you don’t want to do it twice. Ask yourselves, are their moms coming? Or will they stop by later to collect the kids? 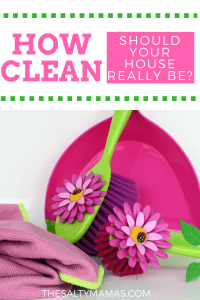 Dishes are fine, and toy messes are expected, but you should sweep the floors. Throw your unfolded laundry pile into a laundry basket or something. Wipe down the bathroom real quick in case they happen upon it. Oh boy. Time to go full tilt on the common areas. All of the above, plus clean the kitchen. Make sure their pictures are still up in your friend-collage-frame (you don’t want them to think you forgot about them). They don’t see you often, so yeah, they’re maybe gonna judge your house. You don’t want them leaving saying, “wow, they’re kind of letting things go, huh?” Cause they really might. Oh God. Now you have to try to clean furiously, as mentioned above, but you also have to clean your shower and make your bed, because those people may ask for a tour. They may want to see what your shower looks like after the remodel. So bleach the grout while you’re in there. Scrub your baseboards. Wipe down your blinds, they may inspect them and say, “are these real wood,” and you don’t want to have to awkwardly laugh and say, “no, just real dirty, ahahahahaha.” And now you will probably try to hang those pictures you’ve been meaning to get to and fluff your pillows and stuff, because the house is the window to your soul or something. You want your house to reinforce the image you’ve been attempting to project to the world, and not scream out “Fraud! Fraud! FRAUD!” Time. To. Hustle. Just burn the house down. It’s the only way. I’ve found out the secret way to get my husband to go crazy cleaning the whole house is to have a little party. Some kind of “must impress them with my manly castle” instinct kicks in and he cleans and fixes everything! You’re so right, my husband does the same thing! We go into all-hands-on-deck mode. I guess I gotta plan more parties! Seriously, it never fails. Whatever area I DIDN’T clean- the shower, my room, even in between couch cushions!- someone will need to see it for one reason or another! Yes, yes yes! Hilarious and relatable from the duckie potty to the mother-in-law! Thanks for the laugh! Okay you are so funny, I am practically laughing, like seriously. Lol! Just burn the house down! Love it. this is hilarious! we are having houseguests tomorrow–and they’ve never been here before! !–so this came at the perfect time. Eeek! Good luck! And when in doubt… Matches ? OK. That was a great read but I’m exhausted. I’m thinking the next best thing would be to get caller ID and don’t answer the phone to anyone you’re not prepared to entertain! Hahaha! This was hysterical!! The levels of cleaning is so right on! Hahaha! This is so right on!! 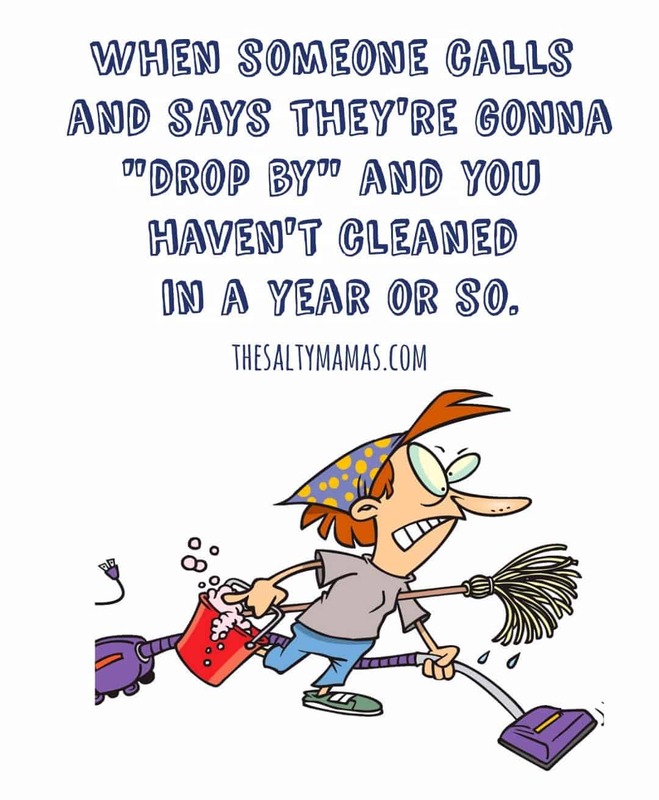 The levels of cleaning in so true!